That packet of pension, estate, or other documents may be repetitive. Some series of records are, with essentially the same or similar material being restated several times. And yet sometimes, buried in one of those repetitive pages will be a word, phrase, or even a sentence or two that reveals significant information. Take the time to read everything. Buried in five pages of “stuff you already know,” may be a thing or two you don’t. If there is a court case that “can’t be found” or a record that is “closed,” remember that there might be some account of it in a local newspaper. I’ve got one 1870 era case where the packet of court papers is “gone.” One option for me is to search the newspapers of when the case was heard and when judgement/sentence was issued in hopes that the newspaper mentioned something. Always keep in mind that there might be a newspaper account of an event as well. And while court records can sometimes be sealed, newspapers are a little more difficult to control in that fashion. To celebrate the end of summer school for me, we’re offering a discounted rate on year 1 issues of my newsletter Casefile Clues. Year 1 of Casefile Clues for $10! (only valid as long as this blog post still loads–if you can see it, the offer is still good). Grow your genealogy, see how problems are solved, sources analyzed, and information organized. We focus on showing the method, not just the one way that worked to solve the problem. Our concentration is on clear writing that explains process. Topics from Year 1 can be viewed here–click back to view this offer page. Obituaries or death notices may appear in newspapers in any of those areas. This is not true for most 19th century deaths, but you never know. Sometimes it happens then as well. Did Your Ancestor Have Selective Memory? A relative of mine gives testimony in a pension case. Most everything she has to say is confirmed from other records and actually her memory for being nearly 70 years old in 1918 and having moved dozens of times is really good. One problem. She forgot her remarriage to her husband–despite the fact that she remembered her five other marriages. Reading through all the information made it clear she had NOT forgot about her marriage. There was no apparent divorce from this husband and mentioning the marriage would have created more problems for her application. There’s always the chance that your ancestor had a reason for being less than entirely candid. What Source Did You Use? One of the many questions is, if I am using those published transcriptions–were they made from the original paper copies, the microfilm, or the handwritten copies made from the originals. Transcriptions can always have the occasional error, being made by humans. Transcriptions made from transcriptions have an even higher liklihood of an error. And there is always a chance something is transcribed incorrectly or omitted. 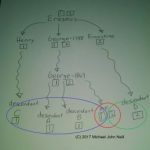 Is writing that 6 generation genealogy too much of a task? Think you’ll never get that much completed in your lifetime? Consider starting small: write the biography of one ancestor. Document as much of her (or his) life as you can, citing your sources as you go. This smaller task is one that you are more likely to complete. When you’ve finished, consider submitting it to the local genealogical or historical society where the ancestor lived for inclusion in their files or possible publication in their newsletter. Then at the very least, you’ve preserved some of your information. And maybe you’ve got yourself started to the point where you are confident to continue writing. Consider ways to preserve your genealogy information before you die. Don’t include it in your will and think that you’re “done.” Libraries don’t always have time to organize unorganized material and some don’t have the funds to preserve it, catalog it, or store it. And your will may tell your executor what to do, but are a few boxes of papers going to be high on their priority list? Will the probate judge care what’s done that box of papers? Will the estate’s heirs and beneficiaries really care? Remember that unless you’re a well-known author, your manuscripts aren’t financially valuable documents. If you’ve contemplated hiring a professional, do the following first: 1) transcribe relevant documents; 2) list what you have searched and what you have not; 3) compile the information you already have; 4) summarize your problem so someone unfamiliar with the person/family can make sense of it. This will save time if you do need to hire a professional because the information you send to them will be more organized. You might even realize when organizing your information that you do not need a professional–at least not yet. When recording information about long-deceased relatives, don’t forget to record information about your own life as well. Write those stories your remember, not just about parents and grandparents, but yourself as well. Someone may want to read those stories someday. Think about other ways to preserve your stories besides a blog. Your goal is for the stories to be around in 50 years, not just 50 days.